The .25-20 (or .25 WCF for “Winchester Centerfire“) has long interested me for its value as a small game and varmint round, and as a neat little cast bullet cartridge. Modest case capacity, moderate pressures, long neck (to protect the lube grooves) and a cast bullet friendly twist rate (twist rate is listed as either a 1 in 14”, or 1 in 16” twist, depending on the manufacturer, both are very friendly twists for cast bullets) form the core of its appeal. The .25-20 was introduced in the mid-1890s in the Winchester Model 92, and amounted to nothing more than the .32-20 necked down to accept a .25 caliber bullet (Winchester wanted to capture the ballistics of the .25-20 Single-Shot, but in a cartridge that was short enough to function in the 92). In the days before the .22 Hornet, the .25-20 was THE flat-shooting long range varmint cartridge of the day. The factory 60 grain jacketed flat-point at 2250 fps was reported to be very effective on vermin out to about 150 yards or so. The 86 grain factory load at a more sedate 1460 fps was better suited for edible small game, but hits got harder out beyond about 75 yards or so due to the curvaceous trajectory. Traditionally, the .25-20 has been held to a pressure spec of about 28,000 CUP, and the maximum product average for factory ammunition is not to exceed 31,200 CUP. Staying within this pressure range, the 86 grain bullets can be launched at over 1700 fps. All in all, these pressures and velocities are very comfortable for cast bullets, hence my interest. A variety of guns have been manufactured in .25-20 over the years, but the one that caught my eye was the sleek little Remington Model 25. Remington made a total of almost 32,000 of these dainty little 5 ½ lb pump-action rifles between 1923 and 1936. A good friend of mine made me a deal I couldn’t refuse on one of these sweet little rifles (24“ barrel), and a casting/loading project was under way. The plain-based flat-point bullets that I would be using for this project include the Ideal 25720 (86 grains) and the Ideal 257283 (85 grains). The gas-checked flat-points that I would be shooting were the Lyman 257420 (70 grains) and H&G #54 (86 grains). I would then wrap things up with some hollow-point bullets, namely the plain-based Ideal 25727 (83 grains), the gas-checked Ideal 257312 HP (converted by my friend Erik Ohlen, 88 grains) and the gas-checked Lyman 257420 HP (67 grains). Of these, only the Lyman 257420 is still offered commercially, but there are other moulds that are suitable for the .25-20 that are still commercially available. For example, NEI still offers 3 moulds that are suitable for the .25-20 -- copies of the 257420 (#17, 257-75-GC), the 257283 (#17A, 257-85-PB, also offered in a 100 grain GC version), and the 257312 (#19, 257-89-GC). Cast bullets used in this loading project; (l-r) Lyman 257420 HP, 257420 solid, Ideal 257283, H&G #54, Ideal 257312 HP, Ideal 25720, and Ideal 25727 HP. In terms of powder selection, there is load data out there for the .25-20 for powders ranging from about Red Dot on the fast side, up to Acc. Arms 2015 BR on the slow side, with 4227 appearing to be just about optimum (and 4227 has been a historical favorite in the .25-20). Generally speaking, for a cast bullet project, I like to work with powders on the slow side for the application as slower pressure rise early on allows the bullets to be engraved “gently”, which usually leads to better accuracy with cast bullets, especially with plain-based cast bullets. Thus, I chose to primarily look at powders like 4227 and slower. 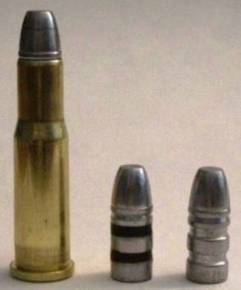 A philosophical aside -- there’s no real reason to try to hot-rod the little .25-20, because no matter how hot you load it, it’s still a small game cartridge, so it makes sense to stay within the SAAMI guidelines. A little extra velocity may be helpful (but not necessary) in that it flattens out the trajectory and gives a little added range, but it won’t promote the cartridge up to being a good deer cartridge. Bottom-line -- the .25-20 is good for shooting bunnies, skunks, porcupines, coyotes, etc. out to about 150 yards. Whether the intended quarry is intended for the dinner table or simple extermination, will dictate the nature of the bullet/load. The beauty of the .25-20 is that it can handle both of these tasks with ease. Ken Waters, in his excellent write up on the .25-20 in Pet Loads, only reported on one cast bullet load, but he liked it -- 9.0 grains of 4227 with 70 grain cast bullets for about 1650 fps. I also asked my friend and long-time cast bullet shooter Charles Graff for his thoughts on cast loads for the .25-20, and that is also what he recommended, so that’s where I started. I loaded up the Lyman 257420 FP and HP over 9.0 grains of 4227 and I got 1665 fps with the solid and 1705 fps with the HP. Accuracy was decent with both loads, but I wanted to see if I could do better, so I started on this loading project. For reference, the Lyman Handbook of Cast Bullets (published in 1958) reports loading data for the 70 grain Lyman 257420 with 9.0 grains of 4227 for 1700, and a max load of 12.0 grains of 4227 for 2100 fps. For the 85 grain gas-checked 257312, it lists a maximum load of 10.7 grains of 4227 producing 1750 fps. Bullets were cast (BHN ~12), sized .258” and lubed with home-made Moly lube. Test loads were assembled using R-P brass and Winchester small rifle primers. Case mouths were flared using a .25 caliber flaring die (from a .25 Hornet die set). Most of these test loads were assembled using H4198, 4227, AA 1680, and Re7, but I also used some faster powders like Unique and HS-6, as well as old favorite 2400. Initial screening/chronographing was carried out at 25 yards, and then promising loads were subsequently tested at 50 yards. All shooting was done using the factory original open (buckhorn) sights. Two things became apparent during the course of these tests -- 1) my 24” Model 25 seems to be faster than the guns used to develop much of the published data, and 2) that some of the published loads are warmer than I would care to shoot on a regular basis. Instead of going through all the details, load by load, I will just touch on a few of the highlights. Gas checks hadn’t been invented yet when the .25-20 WCF came into being, so it only seems appropriate to start the discussion off with some plain-based (PB) cast bullets, especially period-correct PB bullets like the 25720 and the 257283 SWC. My focus here was on loads for hunting edible small game, so I was generally interested in good accuracy with velocities in the range of 1600-1700 fps (higher velocities are better suited for non-edible vermin and will be addressed later with GC bullets, especially HPs). The Ideal 25720 is the original design for the .25-20 Single-Shot (different cartridge case) from the 1880s and it made the transition to the .25-20 WCF (repeater) when that cartridge came along in the 1890s. The Ideal 25720 was available in several different weights, ranging from 46 to 96 grains, with the “standard” weights being 77 and 86 grains. I have two versions of this mould, but for this project I used the 86 grain version since that was the original bullet weight for the .25-20 WCF. This mould design was last cataloged in 1957. This particular mould is kind of cranky about letting go of its bullets, but it does make a nice-looking bullet once you manage to shake it loose. Test loads ranged from very good (9.5 grains of AA 1680, 1745 fps), to decent (8.0 grains of 4227, 1645 fps), to downright awful (7.4 grains of 2400, 1766 fps, key holing at 25 yards). This old bullet made it clear to me that slower powders have a beneficial impact on accuracy with PB cast bullets in the little .25-20. Winchester also made a .25-20 bullet moulds very similar to this basic design (the Winchester design has slightly wider grease grooves and a shorter nose). That particular mould is really cantankerous to cast with due to the grease groove design, so I only cast a few of these up for comparison. The bottom-line is that this mould drops bullets that are nice and round, .257” in diameter, and weigh 86 grains when cast with an alloy similar to WW alloy. This undersized bullet was not nearly as accurate as the Ideal version (which cast at ~.259” and sized down to .258” very nicely). Loaded over 8.0 grains of 4227, the Winchester bullet produced 1641 fps, and decent accuracy. However, over 7.4 grains of 2400, it gave 1750 fps and absolutely terrible groups ( 6-7” at 25 yards with key-holing). The Ideal 257283 is an 85 grain plain-based (PB) bullet, designed right at the turn of the century for the .25-20. Today we would call this a semi-wadcutter (SWC), but that name wasn’t in common usage at that time. It has 2 large grease grooves and a beveled crimp groove. The base band is MUCH thicker (.125”) than those on the 25720 and the Winchester bullet (a thicker base band helps to seal the gases behind the bullet). This is a fine bullet for hunting small game. It was last cataloged in 1964. Testing showed that this bullet design seems to be more accurate than the earlier designs (the design of the lube grooves also makes this bullet MUCH easier to cast). The best load tested was 8.0 grains of 4227, which produced 1680 fps with excellent accuracy. Without question, this is my preferred small game hunting load for this gun. Faster powders like Unique and HS-6 were not as accurate. .25-20 loaded with the Ideal 257283 and the same bullet sized and lubed and as-cast. Gas checks (GC) were invented, and patented, in 1906 by John Barlow, the head honcho of Ideal Manufacturing Co. This little copper cup on the bottom of the bullet protects the base and helps to seal the gases behind bullet, limiting the amount of gas-cutting that takes place on the bearing surface of the bullet. It also serves to scrape clean any fouling left behind from previous shots. Thus, the GC allows cast bullets to be pushed at higher velocities than typical PB bullets (commonly 2000 fps or more). For the .25-20, this means that GC bullets can be pushed at full throttle (if so desired). In 1929, Lyman introduced the 70 grain 257420 GC-SWC (an interesting piece of historical trivia -- note that the cherry number on this mould places it immediately before the landmark Keith SWC, the Ideal 429421). Before this, the .25-20 was loaded with primarily 60 grain and 86 grain bullets. The 70-grain 2567420 offered a very useful compromise in terms of velocity and bullet weight. Lyman still offers the 257420 commercially. The first load tested was 12.0 grains of 4227. This load gave good accuracy, but is hotter than I would want to shoot on a regular basis in this little gun. I wasn’t getting flattened primers or sticky extraction, but the cases were hinting at higher than normal pressures and there were a couple of split necks. Velocities averaged 2215 fps (not the 2100 fps reported in the Lyman handbook), so it seems that my lot of 4227 is a little faster than that used by Lyman back in the 1950s. If I were going to shoot the 257420 with 4227 on a regular basis, I would reduce this charge somewhat. The next load I tested was 13.0 grains of Accurate Arms 1680 with the 257420. This load gave very good accuracy, normal pressure signs and velocities averaged 2117 fps. This is an excellent all-round load for the .25-20. 4198 is reported to give very good accuracy in the .25-20 with some bullet weights. Both 4198 and Re 7 (in 12.9 grain charges) delivered mediocre accuracy with the Lyman 257420, and velocities just under 2000 fps. The Ideal 257312 is one of the very early gas-check (GC) designs dating from 1906. The H&G #54 is basically a gas-checked version of the 257283, and shares some attributes of the Ideal 257312 86 grain GC-FP (i.e. GC, 2 grease grooves, crimp groove, FP). All in all, the H&G #54 is a truly beautiful bullet, and one very much at home in the .25-20. The best load tried with the 86 grain H&G #54 was 10.0 grains of 4227. Accuracy was good and velocities averaged a surprising 1901 fps. Other powders tested with this bullet weren’t quite as accurate. Vermin eradication is well-served by hollow-pointed (HP) bullets as the bullet expansion provides a more humane kill for “hits around the edges”. Cast HPs make excellent varmint bullets, as they are cheap, easy to produce and offer explosive expansion at velocities above ~1600 fps (which the .25-20 can easily deliver). At these velocities cast HPs are too destructive for edible small game, but are very effective for vermin control. A cast HP makes the .25-20 a little gun that’s capable of landing a big punch! The Ideal 25727 is the Express (i.e. a lighter weight hollow point) version of the 86 grain Ideal 25720, and is listed at a nominal weight of 75 grains. It was cataloged from the 1890’s up through 1939. When I bought this mould, it was missing the HP pin. The original design called for a HP pin that extended approximately 90% of the length of the bullet (which had to make casting “keepers“ difficult). 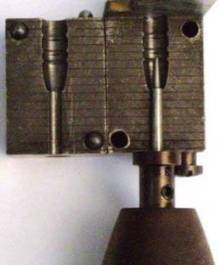 When I made a replacement pin for this mould, I chose a more conservative HP cavity of approximately .500” (approximately 65% of the bullet’s length), and bullets drop from the blocks averaging about .260” in diameter, and weighing a little over 83 grains when cast from alloy similar to WW alloy. OK, I’ll be honest with you, going into this project I figured that this fine old bullet was probably going to be limited to about 1400 fps in terms of best accuracy. Well, I was wrong. 10.4 grains of 4198 was found to deliver very good accuracy and 1725 fps! Wow!!! A good back-up load was found to be 8.0 grains of 4227, which also gave good accuracy and delivered 1651 fps. The Ideal 257312 is one of the very early gas-check (GC) designs dating from 1906. This mould design made high velocity bullet loads possible for the .25-20. This 85 grain flat-point (FP) has 2 grease grooves and was cataloged through 1970. I found a single-cavity mould for this bullet design and sent it off to my good friend Erik Ohlen for conversion to make HP bullets, with a .075” diameter HP pin, that protruded .325” into the bullet, was tapered and had a rounded tip. Bullets dropped from the modified mould at 88 grains, and were .260” and round (a mixture of range scrap and linotype, similar to WW alloy). Unfortunately, my chronograph was on the blink that day, so I didn’t get any velocities, but the best load tested was 10.5 grains of Acc. Arms 1680 (I would guess this load is running about 1600-1700 fps). Also good was 8.1 grains of 4227 (probably about 1650 fps), but 9.5 grains of 4227 wasn’t nearly as accurate. The Ideal 257312 mould after Erik Ohlen converted it to make HP bullets. The Lyman 257420 was also offered in HP form, and I was fortunate enough to stumble across one of these fine moulds. They weigh about 67 grains when cast of an alloy composed of 3 parts range scrap 1 part linotype (similar to WW alloy). Two loads were tried and both gave excellent accuracy. The first was 13.0 grains of Acc. Arms 1680. This powder charge produced a little over 2100 fps with the solid version of the 257420, so the velocity should be similar for this HP load. 11.0 grains of 4227 was also very accurate with the 67 grain HP. oth of these loads would make explosive vermin eradication loads for ground squirrels, prairie dogs and jackrabbits. The most accurate load tested was 13.0 grains of Acc. Arms 1680 with either the 257420 GC-FP or GC-HP. Both of these bullets delivered 5-shot groups at 50 yards of right at an inch with this powder charge (open sights). I have some experience with both of these bullets at a little over 1500 fps from my .25 Hornet Ruger Blackhawk revolver (a fine little varmint gun), and the extra 600 fps will surely add spectacle to next summer’s varmint hunting! 8.0 grains of 4227 was consistently accurate with all of the 85-86 grains cast bullets (PB and GC), and generally delivered 1650-1700 fps with them. The plain-based 257283 with this powder charge (1680 fps) is now my preferred small game load for this rifle. I don’t want any more velocity, and no GC is needed. Simple and easy. This combination is capable of shooting into just over an inch at 50 yards. The plain-based Express bullet from the 1890s, the 83 grain Ideal 25727, was found to shoot very nicely at 1725 fps with 10.4 grains of 4198, making an excellent “old-timey” varmint load. This load shot into 1 ½” at 50 yards (again, open sights). I think I’m going to take this load out after a coyote (or two) this winter. The 88 grain Ideal 257312 HP proved itself to be a very accurate bullet, and loaded over 10.5 grains of Acc. Arms 1680 this bullet should be an excellent load for critters up to about 50-60 lbs in size. Accurate Arms 1680 made a good showing for itself with most of these cast bullets, and being a ball powder meters very smoothly and uniformly. I will be burning a lot of Acc. Arms 1680 in this sweet little Remington. The .25-20 is a fine cast bullet cartridge and one that gives the shooters a feeling of what “old-school” varmint hunting was all about. I like it!